The election for EVE Online's 11th iteration of the Council of Stellar Management begins today and runs through March 25th. For those who don't know the types of things the CSM discusses with CCP, the minutes from the winter summit are now available, HERE. 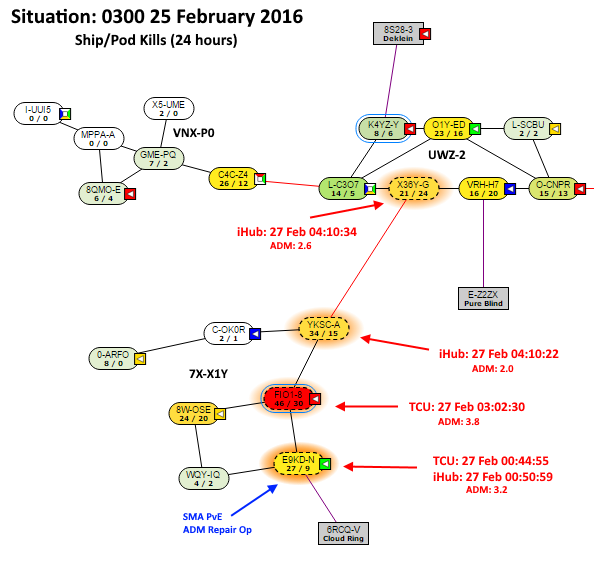 For me, the process ended last night as I participated in the last two analysis shows on CSM Watch. The podcast, a spin-off of the Cap Stable podcast, attempted to interview as many candidates as possible. This year, CSM Watch interviewed 36 candidates, of whom 31 made the final ballot. Hopefully by tomorrow the staff will post the remaining two interviews and two analysis shows still undergoing editing. Another group that does a tremendous job of covering the CSM candidates is EVE_NT. The website of the popular EVE_NT player gatherings in Nottingham now has a news service that covers EVE Online events, including the CSM election. Congratulations to Tiberius StarGazer for a job well done. In addition, EVE-Guardian and the Declarations of War podcast also provided coverage and may still have coverage to post. 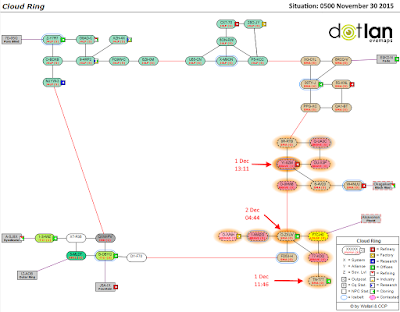 I'll add a plug for my own Google site, CSM Wire. While the site is not as active as last year, I have updated the election page with information from the above listed sources. If anyone has any additional sources of information or podcasts concerning the election, please post them in the comments below. Right now, I'm tired and just want to get some sleep. Imperium propaganda is painting its enemies as in the pay of dirty ISK sellers. I am not sure that is the propaganda angle to take. Of course, I am biased because the Goon/SMA propaganda is making me more cautious about reporting on illicit RMT in EVE right now. I don't want people to think I follow the Goon party line. Given some of the extremely sketchy stunts they've pulled lately, staying away from them is probably a prudent decision. Also, I really dislike the use of RMT as a propaganda weapon. Now, on to the fighting in Fade. After 4-5 days of Pandemic Horde softening up the target constellations of 7X-X1Y and VNX-P0 in Fade through the use of cloaky camping, the more experienced forces of Pandemic Legion, WAFFLES., Spaceship Samurai, Psychotic Tendencies, The-Culture, and The OSS launched an assault on four systems. 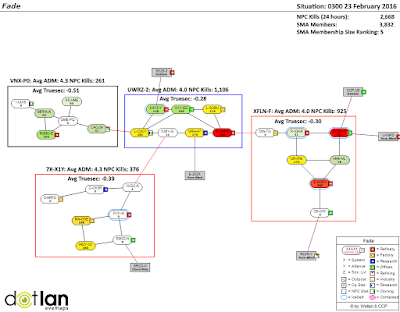 From reading some sites, the current push from Cloud Ring into Fade is the first time Pandemic Legion has made its presence felt in the region. The sovereignty structures are set to come out of reinforced Friday evening in the US time zone. The infrastructure hubs in three of the four systems were reinforced. I can only imagine that SMA managed to save the iHub in FIO1-8. Destroying and replacing the iHubs with their own is a part of the overall strategy of reducing the Activity Defense Modifiers. Infrastructure hubs not only contain system upgrades which can make the maintenance of the ADM easier, but also holds the strategic index. The destruction of an iHub can lower the ADM of a system by as much as 1, which in the systems under assault is a significant blow to the defender. I realize the war isn't very exciting so far, but a major effort to evict an Imperium alliance from its home region is nothing to ignore. I'll try to find interesting things about null sec mechanics for those, like myself, who don't like bubbles. Who knows, maybe something interesting will happen. Yesterday I posted a little about the situation in Cloud Ring and Pandemic Horde's plans to deploy to Fade, the home of SpaceMonkey's Alliance of The Imperium. 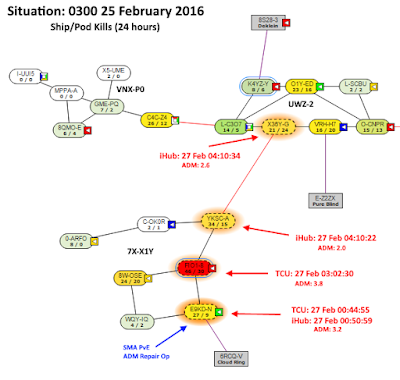 The operation, which involves the mass deployment of AFK cloaky ships in order to degrade the activity defense multipliers of SMA's systems, began on 19 February. I was a bit late to covering the action, so I put together a map to get everyone up to speed. The way we plan to achieve this is intense denial of isk making activities in their home system of Fade by constant hunting and cloaky camping their most valuable constellations. However, this will not be your average cloaky camp and blops campaign. 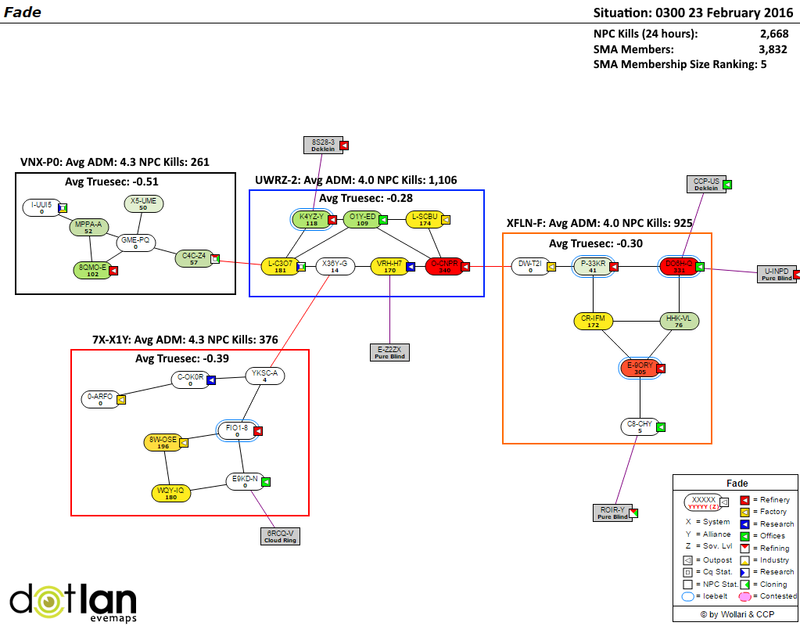 The initial plan called for the constant AFK cloaky camping of the 13 systems in the VNX-P0 and 7X-X1Y constellations. These constellations contain the best truesec, and thus money making potential, in Fade. The plan is working, at least over the 24 hours covered on the map. The 2,668 NPCs killed is a extremely low number in a region like Fade. As a comparison, system CR-AQH in the neighboring region of Pure Blind, with a truesec of only -0.28, saw 12,639 NPCs destroyed during the same period. A) Goons send patrols of light doctrines to keep SMA ratters safe. Many skirmishes and dessie brawls ensue. B) Goons abandon fortress Saranen and redeploy near Fade to prop up SMA using heavier doctrines backed up by supers. C) Fade rots, SMA loses their sov and their income streams. All of these outcomes are favorable so let’s go for it. The victory conditions are known. The starting position is recorded. Now, time to grab the popcorn and witness what may turn into a long, drawn out war. The Beginning Of The End For Gambling Sites In EVE? When we last left Pandemic Horde and SpaceMonkey's Alliance back at the end of November, the Horde had fled to Querious and SMA was battling Brave Collective for control of the south-east quadrant of Cloud Ring. Apparently Psychotic Tendencies. [TISHU], Suddenly Spaceships. [CYN0], Exodus. [LOLGF], and Snuffed Out [B B C] have driven SpaceMonkey's Alliance out of Cloud Ring. The former Imperium alliance I Whip My Slaves Back and Forth [J4LP] is about to lose its last two systems not only in Cloud Ring, but in null sec as a whole. In addition, Pandemic Horde announced a new deployment to Fade against SMA featuring cloaky AFK alts designed to limit SMA's income stream. "A) Goons send patrols of light doctrines to keep SMA ratters safe. Many skirmishes and dessie brawls ensue. "B) Goons abandon fortress Saranen and redeploy near Fade to prop up SMA using heavier doctrines backed up by supers. "C) Fade rots, SMA loses their sov and their income streams. "All of these outcomes are favorable so let’s go for it." As a bit of irony, Pandemic Horde's staging system is Okagaiken, the same system the Imperium staged out of to begin the Kickstarter War. So what, you may ask, does all of this sovereignty fighting have to do with gambling in EVE Online? Remarkably, all the drama and fighting is over a dispute between SpaceMonkey's Alliance and the owner of IWANTISK, a gambling site with a pretty sketchy history. Matterall gave a pretty good account of the events leading up to the war back in January. 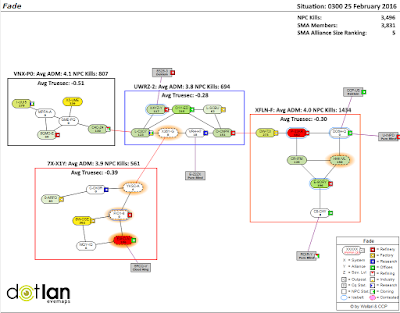 The whole situation reminds me of a conversation I had with DNSBlack in the aftermath of the first SOMERblink RMT scandal in November 2013. During the conversation, he gave as one of the reasons for pursuing SOMERblink the gambling site's support for RvB and TEST Alliance, two player entities that Dirt Nap Squad often fought. With the financial backing of SOMERblink, DNSBlack could not turn off the ISK flow to his enemies inside the game world, so he had to resort to the meta game. What he found wound up embarrassing CCP, as the loophole he found allowed a player to actually sell ISK on the official EVE Online forums. That led to the loophole closing down and the ISK flow ending. The situation involving Dirt Nap Squad, RvB, and TEST really only concerned skirmishing and smack talk in local about how RvB and TEST's losses didn't matter because they were already covered by SOMERblink money. Let's escalate the situation a bit. What if the gambling site paid mercenaries hundreds of billions of ISK every month to try and destroy the second-largest alliance in the game? That is the situation right now, except SpaceMonkey's Alliance has shrunk in size and is now the fifth largest alliance in EVE. "It is worth noting that there are some very rich people who have a beef with SMA at the moment. If our plan works and we can impress them with our work, chances are they can be persuaded to significantly boost the rewards and make it rain on newbeans." I find the whole situation akin to off-grid boosting. On-grid boosting is acceptable, as each side can take counter-measures against the other's boosting ships. Off-grid boosting, on the other hand, is pretty difficult to counter. The situation with out-of-game income generation is worse, as the opponent has no counter inside the game to the immense ISK flow that a major gambling site can generate. If SMA continues to lose systems and members, I wonder how CCP will view the situation. Up until now I don't think gambling sites have ever really played a major role in null sec sovereignty warfare. If a vindictive gambling site operator makes CCP take a second look the in-game effects of such sites, then IWANTISK's thirst for vengeance could wind up ending the devs tolerance for gambling. Military analysts call that a Pyrric victory. "It is the biggest traded item in EVE, and as such, is starting to worry me." I will admit I did not foresee the tremendous demand to buy skill points in EVE Online that the patch last Tuesday unleashed. A couple days ago I posted a comparison of the amount of PLEX purchased in the first two weeks of February this year compared to the same time period in the years 2013-2015. But I think the graph below may surprise a lot of people. Over the first eight days of skill point trading, players spent more ISK purchasing skill injectors in EVE's main market hub of Jita in The Forge than PLEX. How much more? The astounding 90.35 trillion ISK spent on PLEX fell 36 trillion ISK short of the 126.35 trillion ISK spent on skill injectors. Add in the additional 55.33 trillion ISK players spent on purchasing skill extractors on the market and the amount of ISK spent on skill point trading doubled that spent purchasing game time. Great news for CCP, right? A fresh money stream that may bring twice as much cash into CCP's corporate coffers than PLEX, while at the same time possibly increasing the amount of PLEX players purchase as well. So why am I worried? I attended the economics presentation in which Dr. Eyjo spoke the words at the beginning of this post. At the time, EVE's economist worried about the effect of PLEX on the New Eden economy. In the fourth quarter of 2011, PLEX made up approximately 25% of the total trade value in EVE. I divide the EVE economy into two parts. The first is the spaceship economy. The spaceship economy represents all of the items that players buy and sell to actually play the game. The items include items like ships, ammunition, drones, modules, skill books, and minerals. In short, everything that requires ISK to purchase. The second part is the real money trading economy sanctioned by CCP that allows people to trade objects purchased with real life cash (or aurum) for ISK. The RMT economy consists of PLEX, Multiple Pilot Training Certificates, clothing, ship SKINs, and now, skill extractors and injectors. Dr. Eyjo worried about the overall EVE economy when the RMT economy edged towards becoming 25% of the total traded value. With the introduction of skill point trading, I assume that the RMT economy now exceeds the trade value of the spaceship economy on the market. Is such a situation good for the New Eden economy? Since the player-run economy is one of the major features that makes EVE unique, I worry about possible long-term damage to the game in exchange for a short-term financial gain. Of course, the feature is less than two weeks old, so perhaps any worries at this point are premature. But I am interested in seeing how the feature does in six months, so I will keep monitoring the situation. Who knows, perhaps CCP Quant will address the point at Fanfest. Looks like I will need to attend the economy presentation again this year. As someone who follows real money trading in EVE Online, I always watch both the amount of PLEX sold in The Forge, the home of New Eden's main trade hub, and the price of PLEX. Let me state for the record that I was absolutely stunned last week when I saw that 15,345 PLEX traded hands last Tuesday, the first day of the new skill point trading feature. Mark that date on the calendar, as the record will probably last until the servers shut down. To give some perspective on just how big an effect the feature had on the market, I put together a little chart. 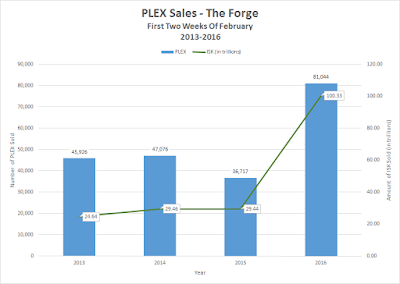 I have sales data for PLEX in The Forge going back to January 2013. In the chart above, we see that the sales dropped for the first two weeks of February in 2015, although that is probably a result of the numbers in 2013 and 2014 benefiting from a large influx of new players drawn to EVE due to news coverage of the battles of Asakai (2013) and B-R5RB (2014). In fact, the 81,044 PLEX sold in the first two weeks of this month is the most PLEX sold in a single month since 87,764 PLEX were sold in December 2014. Let that sink in for a moment. 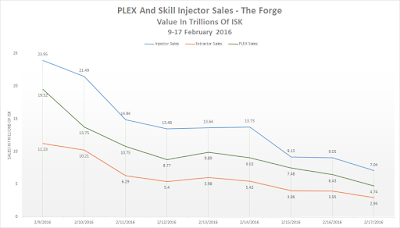 Due to the introduction of skill trading on 9 February, the first two weeks of February 2016 saw more PLEX sold than in any full month in 2015. The astounding numbers do not end there. The difference in the year-over-year number of PLEX sold between 2015 and 2016 of 44,327 represents an additional 3,643 years of game time traded on the in-game market over a two-week span. I should also add that, as far as I can determine, that this month is the first time that the value of game time traded between players has exceeded 100 trillion ISK, and the month is not even half over. Hopefully people will not tire of reading about the effect that skill point trading is having on the EVE economy, because I find the topic utterly fascinating. But the early returns are in. CCP appears to have hit the price point of the skill extractors, and thus skill injectors, right on the nose. I planned on writing a little bit about the efforts of CSM Watch's coverage of this year's CSM election now that the deadline for applying is over. Perhaps tomorrow or Friday. I have RMT news to cover. For those unaware of the latest news in EVE Online, CCP released a patch yesterday that included the new skill point trading mechanics. I do not have data from Tuesday, but apparently everyone and their brother decided to buy skill injectors. Of course, skill injectors are rather expensive, costing a little more than half a PLEX each. I guess that explains why in the first 6 hours of today 3,098 PLEX were sold in Jita. Why is that figure for the amount of PLEX sold so amazing? Because before this week, the most PLEX ever sold in a single day in The Forge, the home region of New Eden's largest trade hub, was 6,161. Based on the start of today, I expect, once yesterday's totals appear either in the market interface or on the CREST API feed, that the record recorded on 1 November 2013 shattered into a billion pieces. Now, to bring up an interesting factoid about the PLEX record. The record was set when an EVE gambling site, SOMERblink, conducted a liquidation sale in response to CCP closing the loophole that allowed the gambling site's operator to launder at least $150,000 in ISK during a 3 year period. Why bring up illicit RMT? Because business is very good for the ISK sellers. The sales volumes at Player Auctions, the illicit RMT site I monitor, are at an unprecedented level, at least in my experience. So far in the first nine days of February, I tracked over 780 billion ISK sold, with over 220 billion ISK in sales yesterday. That is a lot of skill injectors. Once I get more figures, I will write a comprehensive blog post. But for now, just remember that players aren't the only ones excited about the new skill injectors. I will make a prediction. Expect to see a ban wave sometime before Fanfest. With this much dirty ISK moving around, I believe quite a few people will receive a polite letter from CCP Peligro informing them that they won a vacation from EVE Online for a week. Or perhaps, even permanently. On Friday, CCP revealed the Aurum cost of the skill extractors needed to create skill injectors. Aurum is EVE Online's cash shop currency used to buy items like clothing and ship skins. Many players screamed about the costs of the extractors. But before I go into the numbers, I want to express my displeasure about a related topic. To my knowledge, CCP released the news via a tweet. Not a dev blog. Not as a news item. Not in the patch notes. Via a tweet. If I am wrong, someone please point me to the place on CCP's infrastructure where CCP first posted the price. I hope I am wrong, because right now I'm a bit disgusted with CCP over that tweet. If someone really did think that releasing the news via tweet was a good idea, that person should feel bad and banned from eating dessert for a month. Now for a look at the numbers. I think sticker shock took hold when I realized that the price for a single extractor was 999 AUR. My initial conversion to U.S. dollars came up with a price of $5.55. Even looking at the purchase rate when buying a $20 packet of Aurum gave me a price of $4.95. Then the realization hit me. CCP based their pricing strategy on the price of a single PLEX. CCP sells single PLEX for $19.95 and the price of 4 extractors, which can hold 2 million skill points, is $19.80. I should point out that a character with +5 learning implants can train 2700 skill points per hour, or 1,944,000 skill points every 30 days. Since one PLEX equals 30 days of training, CCP came out fairly close to equating the price of game time to the additional immediate skill point gain. My observation, however, was just a first impression. I then approached the issue from the perspective of a farmer. What are a farmer's requirements skill extractor requirements for a six month period? The answer I came up with is that an account can generate enough skill points to fill up 23 injectors. One could spend $95 in Aurum (1 $50 pack, 2 $20 packs, and a $5 pack) to purchase the injectors. The cost is actually $92.21 if two 10-pack extractors and three single extractors are purchased, so the farmer will have some Aurum left over. At this point in my calculations, the numbers came up with something extraordinary. Converting 30 days of training, acquired at the maximum rate using +5 learning implants, into skill injectors, cost $14.95. By some strange coincidence, the price CCP charges for a basic one month subscription is ... $14.95. Nice going CCP. Of course, using real money to purchase the skill extractors defeats the whole reason for the farm. The cost conscious farmer will need to farm enough ISK to purchase 6 PLEX, or already have enough ISK on hand already, to farm skill points from a clone for six months. Of course, the number of PLEX needed is actually 5.4, so the farmer will have 2005 Aurum left over after six months. I do want to point out my assumption is based on a PLEX price of 1.2 billion ISK. Watching the market this weekend, I am not sure the price will stay that low. Will we see PLEX rise to 1.4 billion or perhaps 1.5 billion ISK in the near future? I'm not an expert. I'd say bug this guy instead. I really need to take a break from doing the CSM coverage. 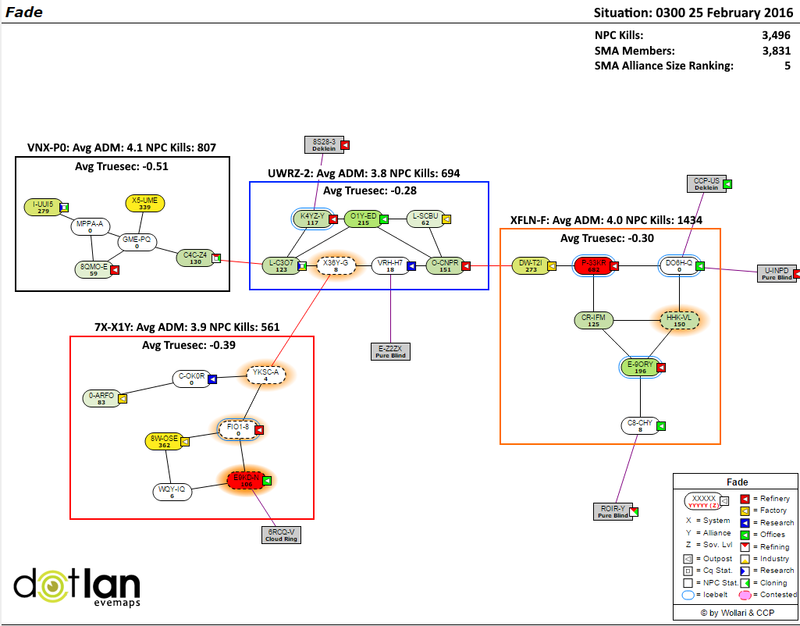 The work is interesting, but activity is starting to pick up in Signal Cartel. First, we marked our first birthday with a day-long party. Where was I? That's right, doing election stuff. I don't want to say we're a little different, but let's fact it, we are. One of the events included Hug-dropping unsuspecting ratters and miners. What's a hug drop? Someone made a "PvP" video, which is below. For those unfamiliar with Signal Cartel and our alliance, Eve-Scout Enclave, we sometimes are described as space hippies. We have our credo, which means accepting that losses happen and to just have fun. But also treat everyone with respect. 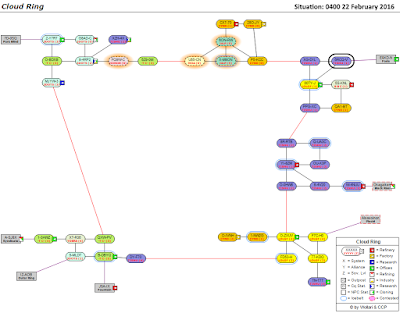 The whole idea is that we are a service corporation serving the game by maintaining Eve-Scout.com, a board we keep updated with a list of connections into and out of Thera, the only wormhole currently with stations. As such, we attempt to maintain a neutral and non-threatening stance towards all, even those who wardec us. As our alliance nears 600 pilots(!!! ), we as an organization face challenges and opportunities we have not previously ever had to consider. -How can we hope to deny gloating rights to the unscrupulous Marmite warmongers along trade hubs we frequent? -How can we fully take advantantage of the massive delivery capabilities of our combined fleet? -What can we do, as a growing organization, to serve the community of New Eden? -What can the corporation's executives do to better supply our delivery agents? These are no small matters, and ones that must be approached with caution lest we lose our identity as a politically neutral covert ops delivery corporation. And yet, we must address them, or we become nothing more than a few hundred pilots with the same letters in the brackets following our names. Taking all of these matters into consideration, I believe the answer to these questions is Thera. SETTING UP SHOPMany of our pilots have sought to buy, store, and move assets from stations without having to deal with wardec corps who take advantage of hisec mechanics to make our deliveries exceedingly difficult. We've also had issues forming up for fabulous opportunities; after all not every Rattlesnake ratting target will be within 20 jumps of Jita or Amarr! So starting immediately, WINGSPAN executive operations will be based out of Thera. This means that for all scheduled operations, with minor exceptions, you can expect Thera will be the starting system. No need to join fleet first or ask "how many jumps is X from staging system?" The answer is "Zero, because it's in Thera." WINGSPAN will also be establishing offices in Thera stations, with the long-term goal of storing ammunition, speciality ships, boosters, and other high-demand products for immediate access. TAKING OUT THE TRASHNow for the unacquainted, Thera was founded as a special type of wormhole system: an enormous region with dozens of wormhole connections, as well as stations (yes, stations) owned by the Sisters of EVE. Upon its discovery, it was thought Thera would become a "new Jita," a trade and transit hub for wormhole explorers like us. But Thera has been besmirched by groups of players who sought to terrorize locals (including the local Signal Cartel, whose explorers provide invaluable information to Tripwire on routes in and out of Thera's many connections). These malicious and highly unprofessional gankers (many of them are 15 years old!) have rendered Thera inhospitable to civilized pilots. Chief among these groups is V0LTA, a 130-boy corporation who have dominated Thera uncontested. They've worked with AQUILA INC, a smiliarly minded organization. Using brute force they've subdued smaller groups, but have never faced an equal or larger organization, let alone one as persistent, dogged, and cloaky as WINGSPAN. I respect V0LTA's work as a ganking corporation. I respect it so much that I am personally ordering INFINITE TORPEDOES, DRONES, AND CHARGES BE DELIVERED TO THEM for as long as it takes for them to accept our gifts as an early retirement package. For the purposes of this mission, I am setting Signal Cartel to Neutral (+0) as their scanning services will make our operations 100x easier. I therefore ask that Signal pilots not be fired upon within Thera, though feel free to send them as many torpedoes as you'd like the second they're out of that system! Saria and our FCs will, I'm sure, provide more information to follow regarding operations details. A BETTER TOMORROWEstablishing a foothold in Thera and clearing it of other delivery organizations will accomplish many worthwhile goals for WINGSPAN as an organization. First, by providing content in the form of the elimination of Thera's worst bottom feeders. We can help Thera can become the spooky superhighway it was always meant to be, and we will have unlimited wormhole chains at our desposal to explore. For the enterprising salespeople among us, the market of Thera will prove lucrative. Sell scan probes at 300% markup! Or perhaps be the nice guy/gal and contract bombers to your WINGSPAN colleagues. Or hell, do both! It should also be noted that Boosters can be found in great supply in Thera, on account of #NoRulesInWspace. Finally, I believe basing scheduled operations out of Thera will give our less experienced pilots (and certainly the veterans too) a much deeper knowledge of wormhole space, astrometrics, and WHAT A MARKET HUB IS LIKE WHEN MARMITE ISN'T ON EVERY UNDOCK. Sure there will be 100 cloaked Proteuses there, but half of them will be ours! AS YOU LIKE IT As with all WINGSPAN corporate initiatives, your participation is completely voluntary. You remain free as a delivery professional to operate from wherever you like. I only ask that you consider the benefits outlined above before striking this path from your possibility. Working together, we can make WINGSPAN a better corporation; we can make Thera a better system. And we can make our pilots better prepared to handle their quotidian task of finding new customers throughout wormhole space. With that said, I'd like to thank everyone who participates, in advance, for their help. I look forward to joining you in these important delivery matters! "The Guy Who Is Somehow In Charge"
So we will soon see WINGSPAN Delivery Service vs. the Therabois, with Signal Cartel flying around trying to maintain an up-to-date listing of all the wormholes leading into and out of Thera. I also imagine we shall see some other corporations, or even alliances, try to honorably third party some of the fights. And to make things interesting we will fly with snowballs and fireworks in our holds. After all, we wouldn't want to hurt anyone. Whether we like the feature or not, skill trading is coming to EVE Online on 9 February. The time for debate is long past, so I will put on my prognosticator's hat and and attempt to determine the cost players will pay in order to advance their characters more quickly. The figure I came up with is 500 million to 600 million ISK. How did I come up with that price range? Time to show my work. First, the professional ghouls with their clone farms have to cover the subscription price. I imagine those running the farms will PLEX their accounts. What is the cost of a PLEX? Currently, the price is hovering around 1.2 billion ISK. 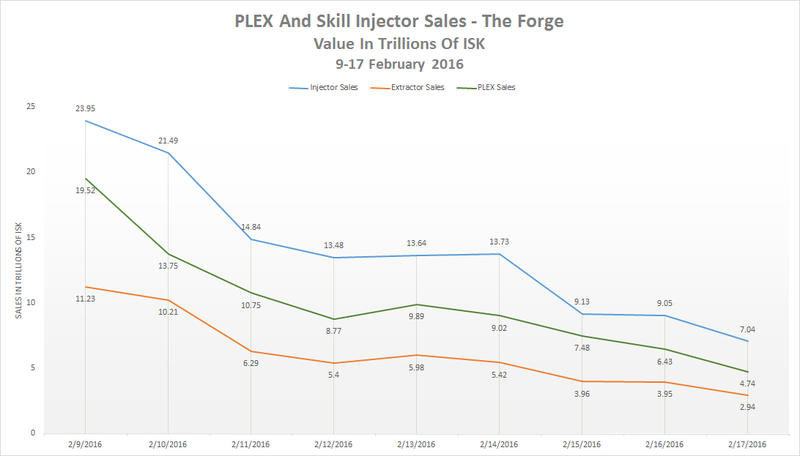 I expect that the price of PLEX will increase as skill point injectors become more popular, but for now 1.2 billion ISK is a fairly round number. Next, how many skill points can a clone generate in a 30-day period? Assuming I know how to use EveMon properly, a character with +5 learning implants can generate 2,700 skill points in an hour, or 1,944,000 in a month. With each skill point injector holding 500,000 skill points, that means a single account can generate a total of 3.888 skill injectors per month. For simplicities sake, let's round the number up to 4 skill injectors. To merely cover the subscription price, the skill point injector manufacturer must charge at least 300 million ISK per injector. If the clone farmer is thinking long term, then substitute the actual figure of 3.888 skill injectors and the total to cover the subscription cost is 308.6 million ISK. But wait, the farmer also has to purchase the skill extractor from the cash shop. Once again, the clone farmer will not want to spend real life cash, so will purchase a second PLEX. The conversion rate of PLEX to Aurum is 3,500 AUR per PLEX. Now for the 64 million ISK question. How much will CCP charge for the skill extractor? As of the time I write this post, CCP has not said. My someone educated guess is between $2-$3 USD. If I were setting the odds, I would put the over/under at $2.50 USD per skill extractor. Since a player in the target skill point range would need to purchase 5 injectors, that means manufacturers would need to spend $12.50 USD in order to create enough injectors to supply a one month supply of skill points. Looking at the subscription price chart, a three-month sub costs $12.95 per month and a six-month sub costs $11.95 per month. I figure the price from the $5 amount, or 450 AUR. If purchasing PLEX in-game to convert to aurum, that means a clone farmer can get 7.78 skill extractors per PLEX. For the sake of the math, I will round the figure up to 8. So the monthly manufacturing costs per clone must include additional half a PLEX, or 600 million ISK, to cover the purchase of aurum. That brings the total monthly production cost per account to 1.8 billion ISK, or 450 million ISK per skill injector. Will the traffickers of skill injectors sell their products at cost? Hardly. But what is a good mark up? I think 33%, which brings the total up to 600 million ISK per skill injector. Since one account can create 4 skill injectors per month, that means two accounts should just about generate enough ISK to purchase one PLEX in order to pay for someone's main account. I personally won't enter the skill injector market. Besides the thought that extracting skills from clones is icky, I am not sure if the demand for skill points will really bear a 600 million ISK price. Personally, I do not believe so. CCP would do better with a $2 USD, or 360 AUR, price point. The only problem with that price is that some illicit RMTers may try their hands at clone farming. Still, I think the big RMT operations won't bother with the low profit margins involved with skill point training. Of course, I'm probably wrong. At least I won't have long to wait to find out.